This Sunday we will celebrate Trinity Sunday, which kicks off the longest season in the Christian year known as Ordinary Time or Kingdomtide. Ordinary Time refers to the part of the Christian year that lays outside of the seasons of Lent-Easter and Advent-Christmas. It is an in-between time where the Church celebrates the mystery of Christ not in one particular aspect but in all its aspects. For example, in Advent we focus on the particular aspect of Christ’s incarnation and in Lent we focus on the particular aspect of Christ’s coming Passion and Resurrection from the dead. In Ordinary Time our focus is Kingdom-minded, which is why some refer to this season as the Kingdomtide. During this season Christians consider texts that invite us to apply in our lives what we have learned from the example of Christ and help further bring about the Kingdom of God on earth. Bringing about the Kingdom of God on earth is anything but ordinary…so do not let that name fool you. It is extraordinary work and, even more amazing, God invites us to be part of this work. To that family I will always and forevermore be Sarah Beth-Ann. The family planned a very small graveside service because that is what Pop always wanted. Pop was a very strong and sensible man. He made sound investments throughout his life; to him it did not matter that the latest and greatest gadget was just released because his version that he purchased in the 1950s was still working. “If it ain’t broke, don’t mess with it” was his policy. His contentment with his material possessions freed him up to really invest in immaterial possessions, specifically his relationship with God and with his family and friends. The fruit of his investment in relationships was evident at his graveside as the quaint corner of Oak Hill Cemetery was overcome by people who loved Pop – family members, friends, folks he mentored, business colleagues, and more. The small graveside service became a large graveside service. We were there for Pop and his family. I was there for Laura. After the service Laura and I connected, first, by eye contact and second, by embrace. Laura and I say that we have been friends from the womb. Our mothers were pregnant during the same time and we met in daycare as toddlers. We went to the same elementary school…and our parents quickly learned that we should not be in the same class together because while we had a great time together it was not always the great time that the teachers wanted us to be having. All our lives we have been family to one another and family comes a-running when a member is in need. Laura and I share this understand of being family to one another because of our relationship with Christ. Individually we know that we are God’s children and because we are God’s children we understand our call to be our sister’s keeper. Jesus teaches that we serve him and build and reveal the Kingdom before our own eyes each time we provide food to the hungry, drink to the thirsty, care to the sick, companionship to the imprisoned, and clothes to the naked. This work may at times seem mundane or ordinary but in fact it is the extraordinary work of the Kingdom! It is work that God desires us to attend to and participate in daily. I find in my own experience that I receive so much care for my soul as a product – and gift – of caring for another’s soul. This is the lesson I was reminded of as I attended Pop’s service with Laura on Wednesday. Jesus participated in this work and he is an heir to God’s Kingdom. Our participation in this work joins and extends the work of Christ and, as his sisters and brothers, we become heirs to God’s Kingdom. During this Ordinary Time may God lead us in Extraordinary Work! *”Prayer for Trinity Sunday,” The United Methodist Book of Worship 412. Walt Disney World has always held a special place in mine and Andrew’s relationship. We spent many dates at Magic Kingdom and Epcot in our high school and college days. We got engaged at Epcot – outside of Japan after we finished our dinner in Italy – where else on earth could that happen without the help of the Concord?! We have been so blessed by friends over the years who work for WDW that have gifted us tickets and helped us experience the magic again. For my birthday Andrew surprised me with a season pass so we can retreat to the wonderful world of Disney whenever we like. One of my favorite experiences at Disney is the fireworks show at Epcot. One of mine and Andrew’s first dates was watching a Fourth of July fireworks show atop Happy Top Mountain in Kentucky while serving on a mission trip together. After he proposed Andrew asked that our first activity as an engaged couple be watching the fireworks show at Epcot; I could think of nothing better. If you are familiar with the show, you know that it is a combination of fireworks and extreme pyrotechnics – complete with a raging fire that flames from a steel globe that sails on the surface of the World Showcase Lagoon. I have viewed this show from many different places along the shores of the lagoon and no matter where I stand, I can feel the power and strength of the heat radiating from the flames sourced within the globe. Sometimes it is warm and pleasant upon my face. Other times it is so intense that I need to turn away. The flames are bright. The flames are full of vigor. The flames inspire. This week we celebrate Pentecost – God’s giving of the Holy Spirit to God’s people and the birth of the Church. Acts 2 tells us “When the day of Pentecost had come, [the apostles] were all together in one place. And suddenly from heaven there came a sound like the rush of a violent wind, and it filled the entire house where they were sitting. Divided tongues, as of fire, appeared among them, and a tongue rested on each of them. All of them were filled with the Holy Spirit and began to speak in other languages, as the Spirit gave them ability” (Acts 2:1-4). Divided tongues, as of fire, appeared among them, and a tongue rested on each of them – tongues that were bright…tongues that were full of vigor…tongues that inspired. I am sure that the powerful presence of the Holy Spirit upon the apostles and those gathered with them created an energy that had never before been seen. Strength and power to heal and to prophesy and to dream and to make dreams reality were at the fingertips of the leaders of the Early Church and they employed this strength and power for the Kingdom’s good! For those the apostles served their presence, gifts, and ministry were welcome, warm, and pleasant happenings; their service drew people towards them like moths to a flame…or Methodists to a potluck. To others the apostles’ presence and gifts caused people to turn away. As we prepare for the celebration of Pentecost and our active remembrance and participation in receiving the Holy Spirit, I wonder how God’s holy fire will manifest in us? Will it rage with such an intensity that we ignite new ways to engage our faith through critical thinking and companionship and compassion? Or will it be like just another day where a fire is started, but deprived of the necessary elements to help it breathe and grow, it fizzles out? I want to be like the flames emanating from the globe at the World Showcase. I want to be bright. I want to invigorate. I want to inspire. I want to do all of this for God’s glory, for the vitality of the church, and for the exponential growth of grace in the world. God gifts the flame and we feed God’s flame by committing ourselves to the needful work of critical thinking, companionship, and compassion in conversation with and in response to our faith. May God’s Pentecost flame burn brightly within each of us; through it and because of it may we illuminate the world. Prayer: “Fire who fuels all fires that burn, suns around which planets turn, beacons marking reefs and shoals, shining truth to guide our souls: come to us as once you came; burst in tongues of sacred flame! Light and Power, Might and Strength, fill your church, its breadth and length.”* Amen. *”Wind Who Makes All Winds That Blow,” The United Methodist Hymnal 538. My morning routine follows thusly: (1) Wake up before the alarm sounds (2) Listen to my pups yawn and stir (3) Scroll through the day’s headlines (4) Pray. The first headline I saw this morning? Reports of another earthquake in Nepal. Once again the aching feelings of fear and loss coursed through my heart. I shared the news with Andrew and he lamented how the Nepali people cannot seem to catch a break. One of my yoga instructors is currently in Nepal helping with relief efforts. My thoughts immediately went to Beth and prayers ascended for her safety. She was assisting with a surgery consultation when the earthquake struck (I know – yoga instructor and certified firefighter/paramedic with specialized training in rural and wilderness medicine – she’s amazing!). She and her team are okay. They will continue to serve in the mounting devastation. And they serve with hope. Many of you have asked if we have an update on our driver Ramesh. We do not. Please continue to pray for him, his family, and all of the beautiful Nepali people. Pokhara is home to one of Nepal’s largest fresh water lakes – Phewa Lake – and is a great look out point to view the Annapurna range of the Himalayas. We were hopeful in traveling to Pokhara that we would actually see the Himalayas. The first day in Pokhara was dismal…cloudy and rainy…and no mountains to be seen. We spent most of the day in a trekking hotel sending wishes heavenward that the clouds would break just for a few moments. Andrew splurged on our room in Pokhara…$15 each night for a room with a view…and as I looked out the windows of our room toward the horizon I spied this. 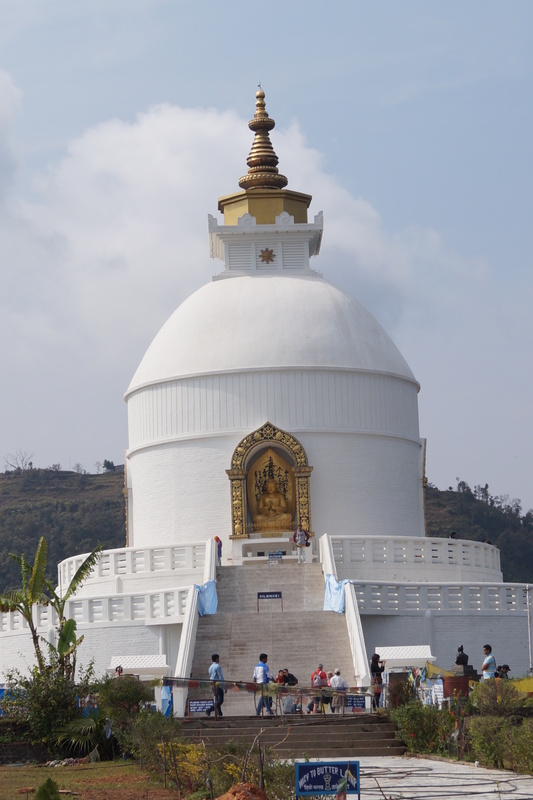 Sitting up on a “grassy hill” overlooking Phewa Lake is a World Peace Pagoda. This pagoda was built under the direction of Nichidatsu Fujii, a Buddhist monk from Japan. He was greatly inspired after meeting Mahatma Ghandi in 1931 and decided then to devote his life to promoting ahimsa, a Sanskrit word meaning non-violence. In 1947 he began constructing World Peace Pagodas around the world. His hope was that these pagodas would serve as symbols to inspire peace and be places where people of all races and creeds could unite in presence and heart in seeking world peace. In the style of traditional Buddhist stupas this peace pagoda has four images of the Buddha facing the four cardinal directions. It is a solid structure. Patrons and guests of the pagoda are not meant to go inside of it; they are invited to prayerfully walk around the stupa in a clockwise path. While upon this elevated space patrons and guests can look out across the horizon, admire its beauty, give thanks to their Creator, and send prayers and thoughts of peace to all the patrons of the world. In our Scripture lesson for this week Paul encourages us to “do nothing from selfish ambition or conceit, but in humility regard others as better than yourselves. Let each of you look not to your own interests, but to the interests of others” (Phil 2:3-4). When we turn our attention to the interests of others we become other-focused rather than self-focused. The World Peace Pagoda was built in Nepal not for people to look inside it but for people to stand around it and look into the world. This structure invites people to look not to themselves but to others with hopes for peace, growth, flourishing, and life. I cannot think of an image more fitting for the Nepali people this day and for all of God’s people everywhere. When we look towards the horizons in our lives, what do we see? Do we see devastation or do we see delight? Or do we choose not to see the devastation so that we only see the delight? To flourish as Christ’s Body on earth, to strengthen God’s coming Kingdom we must come alongside our neighbors in their time of need. We must add our hands, hearts, and voices to God’s mighty work of transformation from destruction to delight. Our God is a life-giving God. We are God’s children. We must add our hands, hearts, and voices to God’s mighty work of transformation. We must do it today. Prayer: “Lord, make me an instrument of thy peace. Where there is hatred, let me sow love; where there is injury, pardon; where there is doubt, faith; where there is despair, hope; where there is darkness, light; where there is sadness, joy. O divine Master, grant that I may not so much seek to be consoled as to console, to be understood as to understand, to be loved as to love; for it is in giving that we receive; it is in pardoning that we are pardoned; it is in dying to self that we are born to eternal life.”* Amen. *The Prayer of St. Francis. If you were raised in Florida – or have spent a significant amount of time here – you know that our state is a wee bit confused about the seasons. Some would argue that we only have two seasons: hot and more hot, but that is not so! We experience all four seasons in Florida…three are just very brief in light of the main season of Summer. Our seasons are also out of order. In my experience we have Summer – Winter – Fall – Spring and sometimes Summer charges in before we even have the benefit of experiencing all of Spring. I thought that would be the case this year. The last bit of Fall concluded a few days before Holy Week began. We made our way towards the cross as the last few dry leaves made their way to the ground. New growth pushed forth. The vibrancy of green was amazing. I sat at the picnic table on the TUMC Bean and wondered at the beauty of the green on this sweet gum tree shading our parking lot. What a vision of Spring. And then someone cranked up the heat. Spring felt like only a brief memory. Summer arrived and when Summer arrives so early we know it will be a sweltering one. That’s what has made these last few days a true gift. We received a break from the heat and retreated back to the coolness and refreshment of Spring. It is not so much a break that it feels like Winter again; we are not retreating for hibernation. We are retreating for refreshment, growth, and strengthening so when the temperatures indicate Summer has arrived in full force (and will stay so till around December 2…) we will be able to handle the heat. We will be able to stay in the proverbial kitchen. We will be conditioned. And we will continue. In our Scripture text for this week we read “more than ever believers were added to the Lord, great numbers of both men and women” (Acts 5:14). This was a time of Spring for the Early Church. The first bud of the resurrection is Jesus and numerous others followed his leading. In Jesus and through his disciples the people experienced profound healing and teaching that changed their lives. These experiences anchored their faith. These experiences drew them one to another and as a community to their Lord. There was great excitement – excitement they could not contain. So they told others. They brought others from their homes to experience it for themselves. They believed in what was happening. They believed it would change the world. And they wanted to be apart of it. In the Wellspring Class this week we discussed the nature and mission of the church – church universal and church United Methodist specific. United Methodists believe that the church is first and foremost a worshipping community and the church is the greatest arena for disciple-making to occur. The church is where disciples are made so that we then will go into the world and make disciples. And friends, we have to believe that this is what God wants for us – for Tuskawilla – for Christ’s Body – for Christ’s bride, the Church. In his letter to the Romans Paul boldly questioned, “If God is for us, who is against us” (Rom 8:31)? The answer is “no one and no thing.” God is for us. And God wants us to experience this Spring, this renewal, this great addition of believers in the Lord to the present believers in the Lord, and together that they would experience a deepening of their faith in the Lord. Belief that God has this desire for us unites us one to another and unites us in the Lord. And this belief sustains us when the heat gets turned up – and I am not just talking about the temperature outside. This belief sustains us when we face temptation, trial, suffering, grief, addiction, loss, and death. This belief helps us spring or bounce back in response to the pressures and burdens of this life. This belief shelters us as we experience the winters in our faith. God is for us. I cannot say it enough. God is for us! And God was us to experience this Spring. Holy God, lead us in being your church, in serving our neighbors, and welcoming great numbers of the faithful to your family. Help us believe and through us bring about your mercy, grace and peace. Prayer: “Great is thy faithfulness, O God my Father; there is no shadow of turning with thee; thou changest not, thy compassions, they fail not; as thou hast been, thou forever wilt be. Summer and winter and spring-time and harvest, sun, moon, and stars in their courses above join with all nature in manifold witness to thy great faithfulness, mercy and love. Great is thy faithfulness! Great is thy faithfulness! Morning by morning new mercies I see; all I have needed thy hand hath provided; great is thy faithfulness, Lord, unto me.”* Amen.